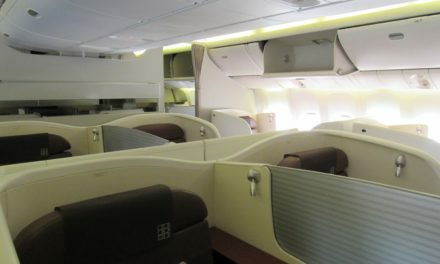 Etihad offers one of the best hard product first classes in the sky. The apartment is one of its kind, and I loved my experience flying it. On this trip, I had the chance to fly them from JFK to AUH to SYD. The flights were amazing, a noticeable improvement from my previous experience flying them from Mumbai to AUH, and from AUH to LAX. The Good: Amazing first class suite, solid food and beverage options, very attentive crew, solid amenity kit. The Bad: The only noticeable thing I found to be bad was the seat was not very comfortable when watching TV or lounging, given its limited recline. The Noteworthy: I love showers on planes, there’s something magical in showering at 37,000 feet in the sky. Also, it is the only airline suite I have been able to walk around in, it is large enough for someone to “stroll” (for like 6 feet). This award was a tough award to book. I had originally planned to fly from JFK to LAX to SYD with AA and Qantas. I had an issue trying to find award availability, as is common with Qantas, and eventually gave up. 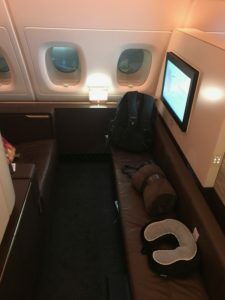 I had racked up a lot of miles in the previous months after signing up for the AAdvantage Aviator (which had a 60K sign up bonus) and heavy flying. After a LOT of consideration, and searching for award availability, I decided to splurge on Etihad’s Apartment. This award, although sold by Etihad as one ticket, needs to be booked as two separate itineraries. After all was said and done, I was down some 215K miles. It was heartbreaking to see my miles drop so drastically, but I told myself it would be worth it. I arrived at JFK from my 10pm flight at 5pm. I was flying in from Houston, and only had a carry-on for my 10 day trip. Since I didn’t need to exit security before the check in counter opened at 7, I stayed at the American Airlines Admirals Club for a while. Check in was a breeze, as there was a specific agent working with First class passengers, and there are a max of 9 on any Etihad A380. Within minutes I had my boarding pass and proceeded to Terminal 4’s infernal security line. I easily spent 25 minutes on the Pre Check line. I can’t imagine how long the regular line takes, probably close to 45 minutes. I arrived at the lounge before it opened, so I walked around the terminal. For the lounge review, see here. I left the lounge about 30 minutes before boarding was scheduled to commence. The gate was a frenzy. There were two other flights departing close to our gate, and trying to listen to the gate agents’ announcements was a challenge. Eventually, they put up signs for the boarding process, and EVERYONE rushed. There was one line for First and Business passengers, which was rushed by people in economy. Sorting the people to the right section in order to facilitate boarding was a struggle for the agents. Five minutes before scheduled boarding, they invited me to board, as I was the only First Class passenger at the gate. As soon as I entered the cabin, one of the First Class flight attendants looked at my boarding pass and escorted me to my seat. The cabin is simply stunning, between the mood lighting, the spaciousness and the accent lights. It is organized in a single aisle, with each suite having its own privacy door. At the front of the cabin are two bathrooms (one with a shower) and the Residence. The suite itself is the largest first class suite I have ever been in. There is enough space for three people to sit/stand. There is a bench/couch that becomes the bed when you want to turn down. The seat proper is a Poltrona Frau upholstered recliner, with very limited recline however. When I arrived, there was a decorative pillow on the seat, as well as a plush blanket on the couch. Each seat has its own full sized vanity, and inside I found the amenity kit, which was fully stocked. Next to the vanity was a power port. Each seat has a variety of lamps and light fixtures. Returning to the seat, next to it there is a panel that controls the seat, as well as controls for the lighting. There are also a physical button controls. The IFE screen is fairly large, not the largest in the world, though. It does swivel out of its place in order to be able to watch TV when you are lying on the bed. Beyond the amenity kit I previously mentioned, each seat got a plush blanket (one of the softest I have ever seen on a plane), noise cancelling headphones (which were just ok) and a pajama set. Each seat has its own mini bar in a very inconvenient and unknown spot, I only found out 1 hour before landing. As soon as I was settled in, the purser, a lady from Uganda or Kenya (I can’t recall, as we talked about geopolitical issues of the region as a whole) came over to introduce herself and ask if I wanted anything to drink before departure. I asked for a glass of champagne , Billecart Salmon 2006, and orange juice. It came with a warm towel and two dates. 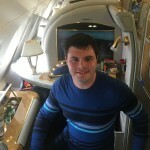 Subsequently, the in flight chef, a young man from Macedonia, introduced himself and brought the menu with him. He explained it was a dine on demand concept, and that I could order anything from the menu whenever. He also explained he could be creative and prepare something else that wasn’t on the menu if it was possible. After my conversations with the flight crew, the captain came on the PA to announce our flying time, estimated arrival time and explain the flight path. We pushed backed about 10 minutes after the announcement, and after a slow taxi to the runway, we began our take-off roll. It always impresses me how such a behemoth of an aircraft can take off, let alone stay in flight. I was glued to the tail cam available in the IFE during the entire take off. The food on Etihad, in my experience, is gourmet, but not the all around best. I had three meals on the flight, and they were all good, but none of them left a permanent impression in my mind. After I placed my order, the flight attendant brought my drink of choice, more champagne, and ramekins with almonds, wasabi edamame and olives. First, the table setting was placed. 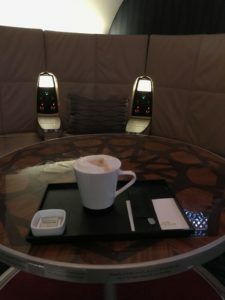 It is a full set, and cutlery is rotated out just like a restaurant, as opposed to be delivered all at once like in US-based carriers’ business class. There was a butter ramekin, and a ramekin for olive oil. There was no bread basket, instead if you wanted bread, they would offer it with every course. For my first course, I ordered both the Tomato Soup and the Spinach and Lentil soup. The lentil soup was excellent, but the tomato soup was a bit of a let down. Between the soups and the main course, the flight attendant brought a lemon sorbet to serve as a palate cleanser. For my main meal, I ordered the lamb biryani. It was really flavorful, but it didn’t compare to the one I had at the GVK First Class lounge in Mumbai. For dessert I ordered the pistachio cake, almond brittle and vanilla ice cream plate. This was the highlight of the meal. The pistachio cake was warm, soft and tasted freshly baked. After I slept for five hours (more on that next), I ordered tea to wake up. It came with sugar and biscotti. At that point I ordered breakfast. Again, the table was set up elegantly. First, they brought out a selection of pastries. Followed by my order of a full English breakfast. I’m not a big breakfast person, but the eggs were cooked very well and the tomato was neither undercooked nor burned to a crisp. For my pre arrival meal, I ordered the Etihad Steak sandwich. I found it to be a bit undercooked, for my taste, but I know others will appreciate the pink in the steak itself. The sandwich was small, but it really hit the spot. 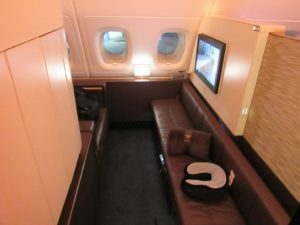 Etihad’s Apartment is one of the few cabins out there that has a separate bed aside from the seat. When I was tired after my meal, I requested turn down service. The bed was made with a mattress pad on top of the extended couch. A real pillow was placed at the bedhead. On the pillow the flight attendant left a note with a beautiful Dr. Seuss quote. She closed the suite doors, and told me to ring the call button if I ever needed anything. The bed was comfortable, but I found it a bit narrow for my frame. I am a 5’10” guy, and I found it difficult to sleep on my belly. Even though I was not super comfortable, I slept for 5 hours. The cabin was kept at a reasonable temperature. Midway between my breakfast and my snack, I went to the Lobby on the plane. The Lobby is a social place for passengers to gather. It is there in lieu of a bar. While I was there, not a single other person sat with me, and I just spent that time watching BBC on the large screen and drinking coffee. The IFE screen, as mentioned earlier, is not gigantic. However, it has a few features I was a big fan of. First, you can split screen it, and watch live TV on one side, and then in flight map on the other. You can also use it to contact other people on the plane, and place a call to the FAs instead of using the call button. I left the best anecdote for last. After my snack, about 1 hour before landing, I had booked a shower. There are only two airlines that offer shower suites on their planes: Emirates and Etihad. Although Emirates’s showers are a testament to their gaudy-ness and luxury, the Etihad ones are more subtle and elegant. The showers don’t have that much decorations, but they have quality shower products, as well as a blowdryer. Each person gets 5 minutes of water, and pressure was good. I recommend shutting off the water while you lather, as it gives you more relax time under the warm shower. Service on this flight was very polished and attentive, but not proactive. I often found myself pressing the call button, and didn’t often see the FAs coming through the cabin. The inflight chef doubled as a flight attendant during the purser’s down time. Too soon it seemed that we were preparing for landing. The entire First Class crew came by each passenger to thank them for flying and ask if our flight met our expectations. After a long descent, we landed in Abu Dhabi. I had to say goodbye to the majestic aircraft and its crew. I was sad, but also excited to see how the next flight would compare to this one. The Etihad apartment was an excellent choice for my trip to Sydney. Although a very expensive award redemption, it was totally worth it. The hard product is the best I had flown so far, and since. The food was gourmet, but not award winning, and the crew get an 8/10. There is always something magical about a shower in the sky, and that is an experience I wholeheartedly recommend. 215,000 miles. One way? Ouch. Looks fabulous but at that price point it better be. Yeah, it was a ton of miles, but the ticket price was close to 10,000 for the one way, which means I still got about 4.6 cents/mile, which isn’t terrible. Considering my dates, and the fact that AA’s flight was around $6,000 in business, I didn’t hurt as much lol. Hi- Were you able to add the HOUSTON to JFK flight via AA on to the same ticket? Did you have to call AA to book this? Thank you! I was unable to add the IAH-JFK legs because, as no surprise, AA did not have award availability. If they would have had, I think I might have been able to tag them along. Hope this helps!